Keith Curle says he and the Cobblers players ‘want to put it right and rectify things’ following last weekend’s disappointing 3-1 defeat at Sky Bet League Two strugglers Cheltenham Town. The Town boss felt his team was well below par at Whaddon Road, and refused to use the fact key men Aaron Pierre and Jordan Turnbull were missing as an excuse. The decision to throw teenager Ryan Hughes in at the deep end in the centre of defence for his Football League debut was questioned in some quarters, but Curle insists the defeat was down to the team’s mindset, rather than any individuals. And as the team prepares for Saturday’s clash with Port Vale at the PTS Academy Stadium, Curle is expecting his team to return to the good habits that saw them piece together an eight-match unbeaten run before the weekend trip to the Robins. Asked if he was hoping for a reaction to the defeat, Curle said: “I don’t build my career on hope, and we are a work in progress. “The work started after last Saturday’s game with the conversations we had with players individually and collectively. “We want to put it right and rectify things because we like winning games, we don’t like getting beaten, but there is a difference between wanting and needing, and I think that has been evident. “We have needed to win games, and on Saturday I don’t think there was that need. “Everybody went out and wanted to win, but there are things that you need to do, and makes sure that you do. You need to be more competitive and show more intent. “We have gone out and we have stopped teams from playing, that has been our foundation. “We stop the opposition and then we earn the right to play in the right areas, and on Saturday I know that we didn’t have the mindset of stopping the opposition first and foremost. So how have the players reacted to a first defeat since being thumped 4-0 by Colchester United way back on February 2? “The players didn’t like it, but identifying you like the feeling when you win win, but you don’t like the feeling when you lose doesn’t make you a winner,” said Curle. “It is a case of we need a reaction and we need a response. “The mindset now is that the Cheltenham game has gone, it’s been dealt with, and and now we move on. “I’m not one to dwell, but I am very good at setting the tone and setting the bar and the levels that are required. “Saturday as a group, we didn’t reach those levels, and the players know that, the players are aware of that, but we haven’t dismantled the good work we have been doing. “The easy thing to do is to go into the changing room after a defeat and lambast everybody and tell them how it is, and it would probably make me feel good for 20 minutes. “But I am more precise than that, I am more concise than that, because I have got an empathy with the players. “I have been involved in games as a player when we have lost, and it is a learning environment we are trying to create here. 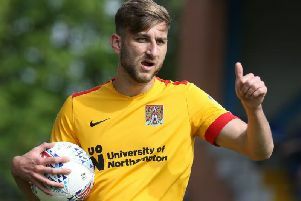 The Cobblers are expected to have Pierre and Turnbull back in the frame for the clash with Vale, from international duty and injury respectively, vwhile there is a chance midfielder Shaun McWilliams and striker Junior Morias could also be fit and available for selection.